When your smile is healthy, your gums are wrapped snugly around each tooth. However, if you have gum disease, then this close connection loosens, and there can be deep spaces around your teeth called periodontal pockets. What is the significance of periodontal pockets? Read on for an explanation from a board certified periodontist in Colorado Springs. How Do Periodontal Pockets Form? Your mouth is home to millions of bacteria that are constantly forming a sticky film of plaque on your teeth and along your gums. If not removed with daily brushing and flossing, the plaque hardens to become tartar. Toxins from oral bacteria continue to form on tartar, leading to inflammation and the start of gum disease. This inflammation and swelling can cause pockets to form between your teeth and gums. As your gums pull further away from your teeth and the pockets grow larger, they become the perfect space for more plaque and tartar to hide. As a result, there is more inflammation, the periodontal pockets grow deeper and eventually the bone that holds teeth in place is threatened. When this happens, the risk of tooth loss increases. How Are Periodontal Pockets Found? That last one—longer looking teeth—may indicate enlarged periodontal pockets. A dentist or periodontist in Colorado Springs can measure the depth of pockets with a periodontal probe. Measuring from the top of the gum tissue to the bottom of the pocket, a depth of four millimeters or more indicates that some periodontal tissue has detached from the tooth. In this case, there may also be bone loss. How Are Periodontal Pockets Treated? The first step is treating gum disease with a professional deep cleaning of your teeth that is also called scaling and root planing. During this procedure, plaque and tartar are removed from the surfaces of your teeth above and below the gum line. Then the roots are smoothed so bacteria are less likely to stick. If there isn’t significant bone loss, then this may be all that is needed to reverse the effects of gum disease. 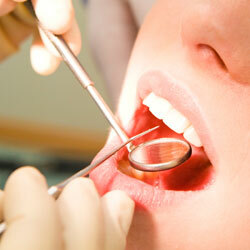 However, deep periodontal pockets may require surgical treatment. Your periodontist will be able to make the correct diagnosis and recommend the best course of treatment to restore your oral health and help you avoid tooth loss. What’s the best way to avoid gum disease and periodontal pockets? Take care of your teeth with daily brushing and flossing. But if you see any of the warning signs of gum disease, then please call a periodontist in Colorado Springs to schedule an appointment. Rocky Mountain Periodontal Specialists are a team of periodontists offering excellence in specialized dentistry, including treatment for gum disease in Colorado Springs. To schedule an appointment, please feel free to contact the office by calling 719-387-0464 today.